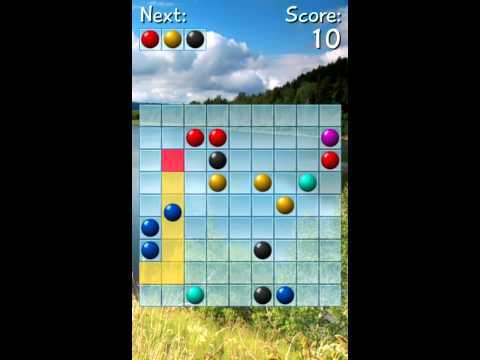 Avoid filling the board by forming lines of five or more balls of the same color in this addictive free game! Try to get the highest score with combo bonus! Customize the game with the many included backgrounds! And you can also play with shapes instead of colored balls! - The goal of the game is to remove balls by forming horizontal, vertical or diagonal lines of five or more balls of the same color. - You can move a ball to a particular place if there is a path of empty cells between the current position of the ball and the desired destination. - If you form a line, you gain one turn. If not, three new balls are added. - The score increases depending on the number of balls removed per line. - Build several lines in consecutive turns to get combo bonus. - The game ends when the board is full. - Color blind people can go to the options menu to play with shapes instead of colored balls.